Hello all! My name is Kathy and Misti has me doing a little “guest blogging” for her now that they’ve hit the trail. 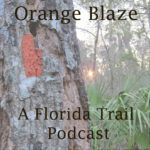 My hubby Randy and I just dropped Chris and Misti at the Florida Trail on Loop Road this morning. They stayed with us a few days this week before this trail adventure. It was nice seeing them in what amazingly enough has been almost a year since they left South Florida. Chris got out to Fakahatchee one day while Misti and I went “thrifting” all over town. We hit up a few of my favorite local shops and of course Misti did lots of window shopping as they’re shipping back whatever isn’t carried on their backs. We talked about how relaxed they were leading up to the hike and Misti mentioned that it’s just not as daunting after the A.T. I guess it’s all relative and I can certainly understand that! Now that they’ve done the A.T., I guess there’s not a lot that will make them nervous about a hike. 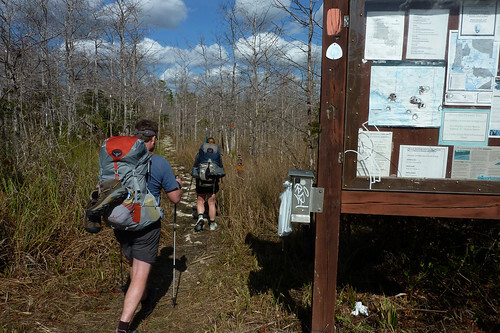 At least the Florida Trail is mostly flat, but they weren’t looking forward to the mud that was most likely at the beginning of the trail. We drove out to Loop Road this morning to drop them off. They’re well prepared and Misti brought her colder temp sleeping bag which is good because it looks like we’re getting some more cool weather. 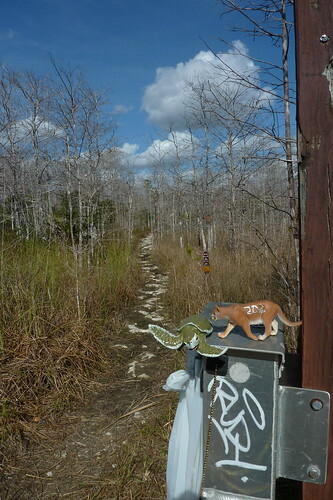 We took some parting shots and sent them on their way…”Ridley and Panther” take on the Florida Trail! 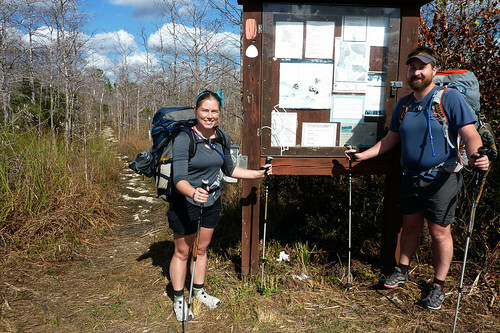 Looking forward to keeping up with them on the trail with updates here on Misti’s blog! Oh good! The weather looks nice! I was watching the weather channel and it seemed like Florida was getting rain and cold temps, but I didn’t know where you were in Florida. Have fun!!! The weather looks to be perfect for the next 10 days. 70’s in the daytime, 50’s at night, and dry, dry, dry! Good luck on your next excellent adventure! Zoe says, “Look! Its turtle and kitty cat. I gave to Uncle Kiss and Aunt T.” She says hi. I sure miss y’all! Have fun out there. Love you! First off I want to say terrific blog! I had a quick question which I’d like to ask if you do not mind. I was curious to know how you center yourself and clear your mind prior to writing. I have had a difficult time clearing my mind in getting my ideas out. I do take pleasure in writing but it just seems like the first 10 to 15 minutes are generally wasted just trying to figure out how to begin. Any ideas or tips? Thanks!